Greetings! Are you searching for Ahsanullah University of Science and Technology? Then visit our site and read this article. Here, we have described all the information about this university. And, we also have written the admission process of AUST. So, read the article below for more info. Ahsanullah University of Science and Technology is the first and leading private engineering university in Bangladesh. And, its nickname is AUST. It was established in 1995 at Dhaka Tejgaon Industrial Area. And, that is the permanent campus of this university. This university’s campus contains 1.6 acres or 5 bighas of land. It’s 10 storied building area is 4 lac sq. ft.
Now, the chancellor of AUST is President Abdul Hamid and A. M. M. Safiullah is vice-chancellor. This university has its own two power supply generator and water supply. And, it also provides many facilities like common room for male and female, big lab and library, indoor and outdoor games etc. 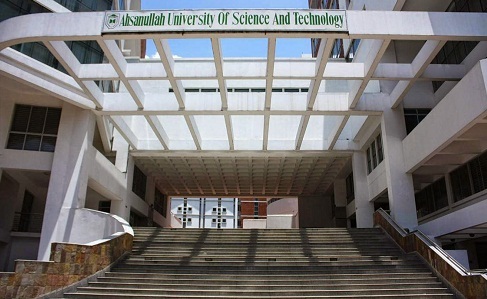 The Ahsanullah University of Science and Technology has four faculties and under them have several departments and courses. And, they are given below. Department of Civil Engineering (CE). Department of Electrical & Electronic Engineering (EEE). Department of Mechanical and Production Engineering (MPE). Department of Computer Science & Engineering (CSE). Department of Textile Engineering (TE). Department of Arts and Science (A&S). In these departments above, AUST carries their graduation, post-graduation, and B.Sc. degree courses. And, it also provides some diploma and short courses. Ahsanullah University of Science and Technology is not only the leading private university in Bangladesh. It also has some great rank on all university lists. You will become amazed by hearing its ranking in worldwide. AUST is in the third position among all the universities in Bangladesh. It includes public and national universities too. And, in the Indian sub-continent, it has 77th position. Now, it also has a place in all the universities ranking list of all over the world which is the 7084th place. So, you can see what great ranking AUST has. Ahsanullah University of Science and Technology fee is quite costly. And, their costs in semester wise are Architecture 5 years cost is 8, 28,400.00 Taka, Civil Engineering 4 year cost is 6, 67,600.00 Taka. And also, 4 year courses are EEE cost 6,67,600.00 Taka, CSE cost 6,67,600.00 Taka, TE cost 6,67,600.00 Taka, BBA cost 5,32,980.00 Taka, ME cost 6,67,600.00 Taka, IPE cost 6,67,600.00 Taka. Now, if you want to admit Ahsanullah University of Science and Technology then you must pass SSC and HSC exam. In that exam, you have to get minimum GPA 8.0 for engineering and GPA 6.0 for BBA (SSC+HSC). And, for admitting in engineering course you must read physics, math, and chemistry in HSC. For BBA, your GPA should not be less than 2.50 in both SSC & HSC. And, for engineering, your GPA in HSC should be minimum 3.5. Finally, we hope you have found your seeking info. And, please visit our site for more details about Ahsanullah University of Science and Technology.